Premium domains are sought-after domain names with short, common or desirable words. They provide a stronger and more memorable web address for a premium price and present a great opportunity for web hosting companies to increase revenue from domain name sales. With the majority of short and desirable names already taken among the world's leading TLD extensions, Premium Domains allow businesses to get names with better and more memorable brands, and a more memorable name helps drive more traffic to their website. Premium domain names are brand new domain names available for purchase directly from the registry at a higher than normal price. Some have prices just slightly higher than the standard version of the TLD, while some cost significantly more. 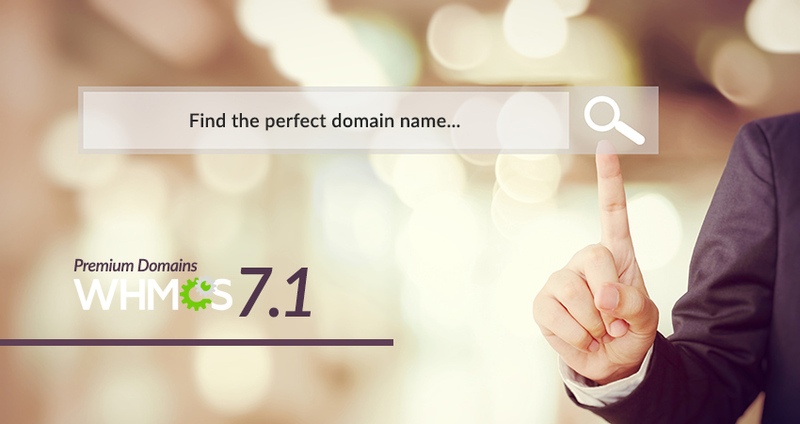 WHMCS 7.1 adds support for selling Premium Domains to WHMCS natively, with support for our two most popular domain registrar provides at launch, and more coming soon as other domain registrars update their modules to take advantage of the new functionality. Selling Premium Domains relies on the ability to perform domain lookups using a domain registrar which can provide information about the pricing of a premium name. WHMCS 7.1 expands the Lookup Provider support offered natively from just Enom to also include ResellerClub. To enable Premium Domains, simply select your preferred Domain Lookup provider and then enable the Premium Domains option. Since the price of premium domains can vary and is not predictable, WHMCS allows you to set pricing on a tiered basis, with different percentage based markups applied depending upon the cost price to you from your domain registrar. WHMCS 7.1 is in the final stages of pre-release testing now, learn more on the WHMCS 7.1 preview site or download the beta today to get involved.